Sometimes you will see that Adsense showing only 2 or 3 links in a 336 x 280 or 300 x 250 pixels slot on particular sites or pages where 4 links can be easily shown. If you will click on the navigation at the bottom of the ads slot, you will see 4 links appearing on the same place. If you are worried about loosing CTR because of less dense ads then stop worrying. 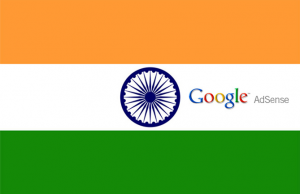 As Google optimizes the expansion of Ads automatically to give you more eCPM. That means, if any one will click on those 1, 2 or 3 ads, you will get more return because those advertisers are willing to pay more for the keywords on your page. When you see a text ad that has expanded to take up more of an ad unit or the entire ad unit, you may be seeing either a placement-targeted or a keyword-targeted text ad. Placement-targeted text ads appear when advertisers select specific sites on which to run their ads, on a pay-per-impression basis. Their ads are then expanded to fill an entire ad unit, making placement-targeted ads even more appealing for advertisers, and resulting in higher bids, meaning higher earnings for our publishers. Keyword-targeted text ads may also be expanded when we determine that a larger ad will perform better for a particular page. Our AdSense technology will automatically determine the optimal number of ads to display and will only show fewer ads when it improves monetization. Please note that at this time, it isn’t possible to opt out of displaying expanded text ads. The number of ads shown in your ad units is automatically determined in order to maximize clickthroughs and revenue. As per the above note, you will get more return if Adsense is showing less number of links in your ads slot whether that ad slot is 336 x 280 or 300 x 350 pixels. 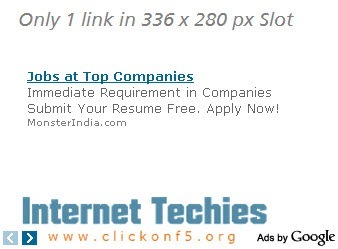 You can see less number of links appearing on “Internet Techies” ad slots. We agree that now we are getting nice eCPM and thanks to Google Adsense for this automatic optimization.